There are numerous reasons manufacturers offer a variety of material choices for bore brushes. The b.. Cleaning your firearm has never been this easy. From precisely designed brushes and cleaning tips to..
Gunslick Cotton Patches effectively remove copper, lead and plastic. 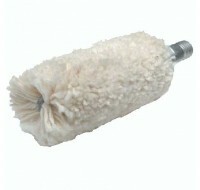 They also boast greater absorbe..
Hoppe's Bore Cleaning Mop are soft cotton swabs that will not harm the bore. These mops are perfect .. These Hoppe's square cleaning patches feature a uniform weave and are pre-cut to avoid fraying. Perf..
Use the Hoppes gun cleaning patches to clean your firearm's barrel. Made from ultra-absorbent and un..